Baby chicks are among the cutest of all Easter symbols. Kids love baby chicks and adults do, too. 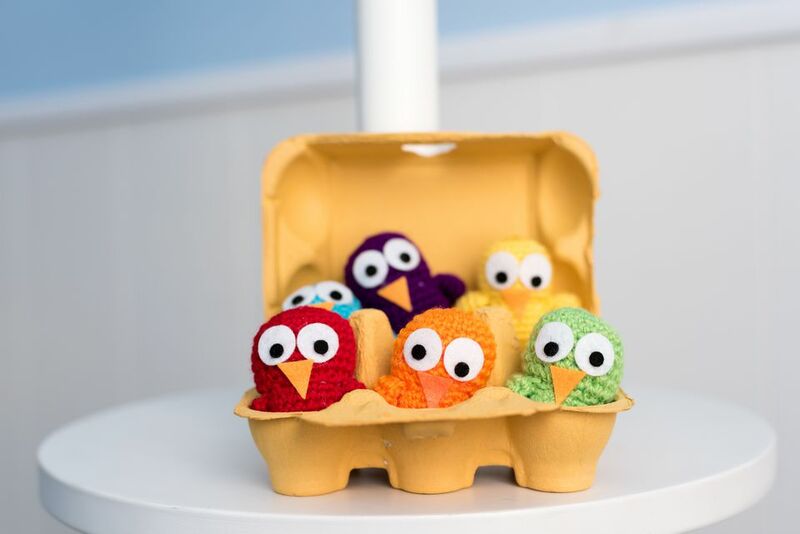 These Easter chick crochet patterns include hats, toys, egg cozies and more. You can use them as gifts in Easter baskets as well as for Easter party decor. Have fun making these cuties! Give your little ones their own personalized Easter tote bags for collecting eggs and treats this season. This crochet pattern is designed with a 3d amigurumi crochet chick popping off of the tote bag. It also comes with Easter eggs. This super cute bag can also be a school bag or activities bag during the spring season. In addition to the chick, this pattern includes instructions for crocheting a bunny and a lamb. Most of the Easter chick crochet patterns that you will find show the chick in a classic yellow color. Get creative and make your chick in an array of colors instead! This amigurumi pattern is a simple design that begins with a colorful crochet circle. It is topped off with colorful yarn feathers. This is the perfect Easter decoration! There are so many ways to decorate Easter eggs, including topping them off with precious crochet Easter egg cozies. This free crochet pattern instructs you in making the basic chick body and then shows different hats to create an entire family of chicks for your Easter table. This little creature will give your own little one lots of fun at playtime. The precious amigurumi chick with hair feathers has his own little egg that he can be tucked into and taken out of. This crochet pattern, which is sold on Ravelry, is part of the designer's Easter Buddies series, which includes ducks and bunnies that all have their own crochet egg cozies to rest in. Love that previous pattern but worried that your little chick will lose its egg? This pattern solves that problem because the chick is sewn into the egg. Flip it inside out and you just see the egg. Flip it the other way and there is the chick. This is such a creative idea! This crochet pattern also includes instructions to crochet a bunny that flips similarly. If you know how to read filet crochet charts then you will be able to make these adorable Easter egg decorations. There are four different charts including one chick and two other Easter birds. These are cute as wall art, bunting or placemats. Peeps marshmallows are a favorite treat at Easter. They come in different colors and different animals but the yellow chick is the most recognizable. Using this pattern to crochet your Peeps brings a sugar-free version of these into your home this Easter. If you want to whip up some crochet Easter chicks in a jiffy, then give this free pattern a go. It eliminates the more complex chick shape, using a basic triangle for the body instead. The details of the beak show you that the triangle is really a chick. These are cute and cozy. Get your little one all dolled up for Easter with a crocheted chick hat. This one is great for taking Easter photos and attending baby's first Easter events! This free crochet pattern is designed for babies who are approximately 6-9 months old. .
Are you looking for a classic crochet Easter chick pattern that you can use for doll-making or decor? This is a great option. It is an easy free pattern for a super simple chick that has basic wings, an embroidered nose, and button eyes.